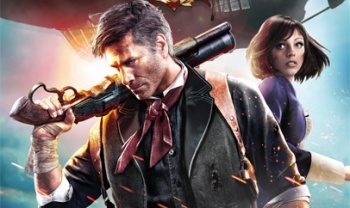 Steam and GamersGate are offering some sweet freebies with BioShock Infinite preorders, but Steam is going to make you work for it. If you haven't got around to laying down a preorder for BioShock Infinite, you might want to direct your eyeballs to Steam and/or GamersGate. Steam first, because hey, it's Steam: Preordering the new BioShock from Valve will net you a free copy of the Industrial Revolution Pack, which includes three gear items, five lockpicks, bonus in-game currency and the Industrial Revolution puzzle game, plus goodies from three extra "reward tiers" that will be handed out if enough people sign up. First up is a free copy of the original BioShock, which may well have been unlocked by the time you read this; the second tier is a collection of BioShock Infinite-inspired items for Team Fortress 2, including the Pounding Father, the Doe-Boy and the Steel Songbird; and the third and final reward tier includes all of the above plus a copy of the strategy hit X-Com: Enemy Unknown. I would imagine that all three reward tiers will be achieved without difficulty, but if you're more interested in a sure thing (and you're not hung up on doing everything through Steam) you can opt for the GamersGate offer instead. Going that route will net you 30 percent of the price in "blue coins" (the cash-alternative currency used to buy games on the site), a free copy of BioShock and a free copy of BioShock 2, Mafia II, Civilization V, Spec Ops: The Line or The Darkness II. You won't get the Industrial Revolution DLC or the TF2 stuff but it is a better selection of games and of particularly interest to anyone who already owns X-Com. Steam's BioShock Infinite preorder deal can be had here, while GamersGate is flogging its wares over here. So what's it gonna be?